Starbucks opens its first U.S. "Signing Store" in Washington, D.C.
Starbucks has opened its first "Signing Store" in the U.S. — a cafe staffed entirely by employees who can communicate in American Sign Language (ASL). In July, the company announced it was converting the Starbucks near Gallaudet University in Washington, D.C. into a Signing Store. Gallaudet is the nation's premier university for students who are deaf or hearing-impaired. Actress Marlee Matlin was among the first customers and tweeted about her visit in sign language. Starbucks said in a statement, "The store will create a distinctive retail experience for all customers, while offering a unique store format that promotes accessibility and offers employment and career advancement opportunities for deaf and hard of hearing people." The Seattle-based company's first Signing Store opened in Malaysia in 2016, according to the statement. A group of American Starbucks employees traveled to Kuala Lumpur on the shop's one-year anniversary to study that Signing Store. Now, over a year later, the Washington, D.C. Signing Store has come to fruition. 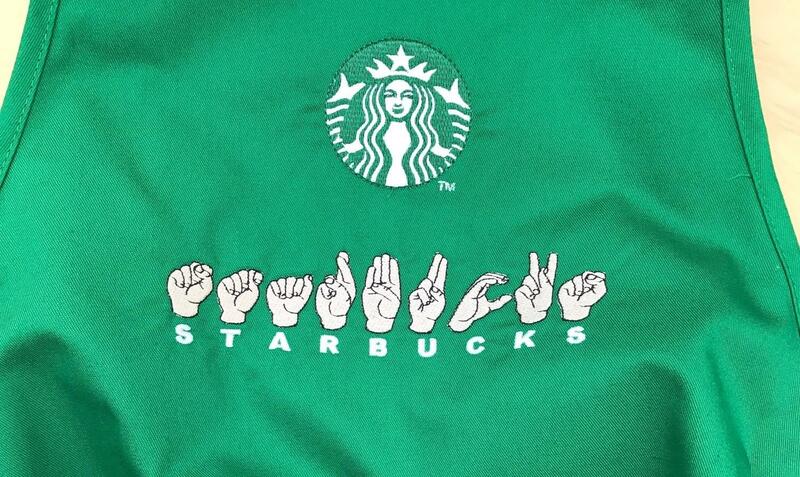 "The National Association of the Deaf applauds Starbucks for opening a Signing Store that employs Deaf and hard of hearing people," Howard A. Rosenblum, CEO of the National Association of the Deaf, said in a statement. "Starbucks has taken an innovative approach to incorporating Deaf Culture that will increase employment opportunities as well as accessibility for Deaf and hard of hearing people, while at the same time educating and enlightening society." Baristas at the store, at 6th and H Streets, wear "I Sign" buttons and aprons illustrated with the word "Starbucks" spelled out in sign; the aprons were embroidered by a deaf supplier, Starbucks' statement read. The coffee shop also has custom branding and decor, from exclusive artwork to a mug designed by a deaf artist. Special deaf-friendly features, like low-glare reflective surfaces, were also incorporated into the store design. These initiatives were created by the Deaf Leadership of the Starbucks Access Alliance, according to the company's statement. And of course, the company says this shop welcomes customers who aren't deaf, too. "For customers new to sign language, the store will offer communication options for ordering and receiving beverages at the hand-off counter," Starbucks said.